A Mom Sues Nutella Maker For Deceptive Advertising : Shots - Health News A California mom is part of a lawsuit that claims the marketing of Nutella as a healthful food is misleading. The maker of the chocolaty, nutty spread stands by its product. 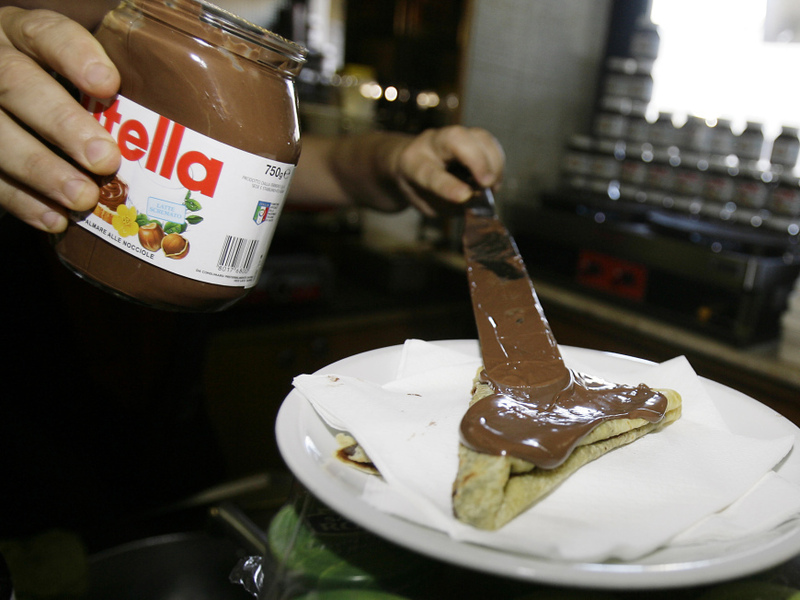 A bartender spreads Nutella on a crepe in a Rome creperie. When I was in high school, one of my French teachers — a person whose opinion I trusted without question — told me that Nutella was, essentially, French peanut butter. For years I clung to the belief that the chocolaty hazelnut spread slathered on bread was a good-for-me meal. When friends called me crazy, it only took a quick Google search to learn that even though you can find Nutella in the peanut butter aisle, it isn't exactly a straight-up nutritional substitute. The discovery shouldn't have been much of a shock, I suppose. A glance at the Nutella label would reveal the first ingredient is sugar, followed by palm oil. And how could something that tastes so good be as healthy as, say, a bowl of Fiber One? Perhaps because I had spent so many years blithely eating Nutella and toast for breakfast, I took special interest in the case of Athena Hohenberg, the named plaintiff in a proposed class action against Ferrero, the company that makes Nutella. The California mom alleges in her legal complaint that she fed her 4-year-old daughter Nutella after seeing ads that represented the spread as "nutritious" or a "healthy breakfast." But last December, Hohenberg's perception changed. That's when she learned from friends that, as her complaint says, "Nutella was in fact not a 'healthy' 'nutritious' food but instead was the next best thing to a candy bar." Nutella contains 21 grams of sugar per serving. Half the 200 calories in a two tablespoon serving come from fat. Ferrero spokeswoman Elise Titan wouldn't comment on the specifics of the lawsuit, but she said Ferrero stands behind its product. Not withstanding my own youthful Nutella experience, how could a mom mistake the spread for health food? I mean, the stuff tastes like chocolate. "So does Ovaltine," Hohenberg's lawyer Ronald Marron told Shots, adding that there are health benefits associated with eating chocolate. Hohenberg wasn't available to speak with us herself. Among other things, Hohenberg's lawsuit seeks a stop to Ferrero's marketing of Nutella as being "healthy," run corrected ads to inform the public that Nutella isn't healthy, and return money the company earned from "any wrongful act or practice." Marron concedes there will be critics of the suit, saying, "Some people might think that this lawsuit never should have been filed. But we want to hold foodmakers accountable." To see some of the health claims, Marron says look no further than Nutella's website. He and Hohenberg aren't the only ones to question the Nutella marketing messages. Jennifer Harris, the director of marketing initiatives at the Rudd Center for Food Policy at Yale University, which tracks food advertising, says her organization noticed the Nutella ads in question about six months ago. "They seemed pretty outrageous," she tells Shots. Harris says that food companies highlight the positive aspects of their food — and they don't communicate the bad things. "The main problem [with Nutella] is it has 21 grams of sugar, which is 5 teaspoons of sugar," she says. "That's obviously not healthy." Instead, the company focuses on the low sodium, the hazelnuts or the skim milk in Nutella. "This is one reason the public health community thinks there needs to be more regulation over what is allowed to be promoted as healthy," she adds. Marron says he expects that the court will decide whether to certify the case as a class action within a year, unless there are other filings.